Outdoor weatherproof and weather resistant bank teller machines are designed for banks, credit unions, financial institutions, and those business owners with a high traffic location requiring an in-wall solution. Weatherproof ATM bank machines are becoming more popular because of record low prices and the explosion of debit ATM and check cards. In many cases, a business, bank, or financial institution require an ATM to be installed in a thru the wall configuration. Bank style cash machines have traditionally been too expensive for small banks or credit unions to afford. 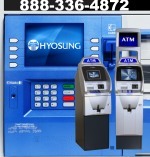 ATM manufacturers of stand up ATM’s are developing and releasing new in wall designs. Nautilus-Hyosung and Triton both have walk up and drive up ATM models. Kiosks are available for some of the ATM bank machines we sell. Parking lots, hospitals, shopping malls, drive up ATM islands and kiosks, if you are looking for an outdoor solution, be sure and contact us. These bank style ATM’s are weatherproofed on most models, but operating temperature ranges should be accounted for. Some outdoor models are weather resistant and should be covered by an overhead protective cover. Some Kiosks include a heating unit, and some also contain an air conditioning unit designed to keep the operating temperature in the safe range. Monimax 5100T: Our most popular outdoor ATM. Available in a walk up configuration.